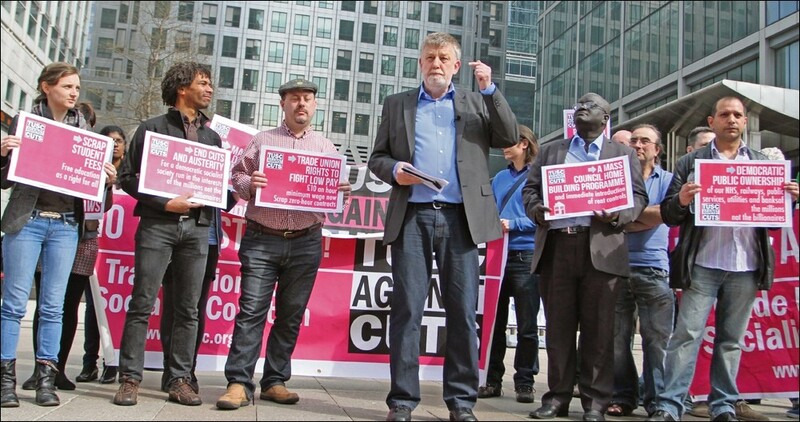 Should the Trade Unionist and Socialist Coalition (TUSC) continue? 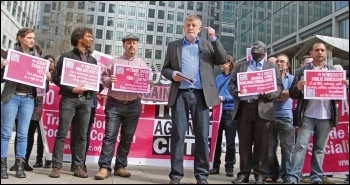 The Socialist Party, one of its cofounders, believes TUSC could still play an important role if it is recast for the period ahead. In early July we submitted a discussion paper to the TUSC national steering committee setting out our proposals, an edited extract from which is below. The Socialist Party supports Jeremy Corbyn's leadership of the Labour Party as a bridgehead for the working class against the capitalists. That includes the Blairite agents of capitalism within the party who, as recent events show, are stepping up their campaign against Corbyn. Building on Jeremy Corbyn's leadership bridgehead is the clearest route, at this point, through which workers could achieve a mass party of our own. But that means being prepared to take on the Labour right wing - including where necessary in next year's local elections. Whether or not TUSC can be the vehicle for that challenge is at the core of the discussion on its future role now underway. TUSC, an alliance of trade unionists, community campaigners and socialists co-founded by the late Bob Crow (general secretary of the RMT transport workers' union), the Socialist Party, and others, was set up in 2010. At that time the capitalist establishment - the wealthy elite who dominate the economy and society - were politically represented not just by the Conservatives and the Liberal Democrats but by Labour too. They had achieved unchallenged control of the Labour Party for 20 years, moulding it politically and organisationally into a new party - Tony Blair's New Labour, continued under Gordon Brown and Ed Miliband - and in doing so had effectively disenfranchised working class voters, who no longer had a mass party they saw as their own. TUSC's aim in this situation was to push forward the process of re-establishing a vehicle for mass working class political representation. In its founding statement TUSC recognised that there were "different strategic views" within the coalition about how to achieve the common end goal. "Whether the Labour Party can be reclaimed by the labour movement", the statement read, "or whether a new workers' party needs to be established", was a strategic question that was left open. Jeremy Corbyn's election as leader posed the question more sharply. It showed that Labour could become the mass vehicle for working class political representation - if his unanticipated victory was to be followed up with fundamental changes to the party's policies and organisation. In the period since Corbyn's victory the Socialist Party, one of the constituent organisations of TUSC, has applied to affiliate to Labour on the same terms as the Co-operative Party, to be free to fight for the socialist policies and organisational changes needed to transform Labour without losing its political independence. The RMT, another TUSC constituent organisation, expelled from New Labour in 2004, has also debated whether it should re-affiliate to the Labour Party. But three years after Corbyn's initial leadership victory it is clear that the political and organisational legacy of New Labour is far from being overturned. The Parliamentary Labour Party (PLP) is still dominated by the Blairites; right-wing Labour local councillors continue to slash jobs and services; and the structures of the party remain much as they were under New Labour. The RMT at its recent special general meeting (SGM) decided not to re-affiliate to Labour at this stage and on the terms offered. The SGM agreed that Labour "has the potential to be a mass party of the working class" but that the RMT could best "support, defend and develop the socialist advances that have been made" through its own independent political activity. The Socialist Party has not been readmitted. Events could develop - the formation of the long-touted 'Stop Brexit' centre party with a big chunk of the PLP splitting away, for example - which could hasten the process of transforming Labour into a workers' party. But equally the current situation could drift on unresolved. The possibilities shown by Jeremy Corbyn's leadership victories have not been exhausted. Three years on, however, it is necessary to soberly assess how the goal of workers' political representation can be realised. That includes discussing what TUSC's future role in that process could be. One of the most important priorities will be to step up campaigning against austerity policies being implemented by right-wing Labour-led local authorities. Sabotaging Jeremy Corbyn's anti-austerity message, they are undermining the chances of winning a Corbyn-led government and for that reason alone cannot be left unchallenged. Building in particular on the struggle of Liverpool City Council in the 1980s, but in the new legislative framework for local government, TUSC has pioneered a strategy of councils using their prudential (legal) borrowing powers and reserves to formally 'balance' no-cuts budgets to buy time for a mass campaign for increased government funding. Detailed information on council reserves and guidance material on how to prepare a no-cuts 'Peoples Budget' has been produced. TUSC supporters have won significant backing for this strategy in the main local government unions, Unison, Unite and the GMB. And we have engaged in a dialogue on this issue with those minority of Labour councillors who are looking for a means to turn anti-austerity words into action. 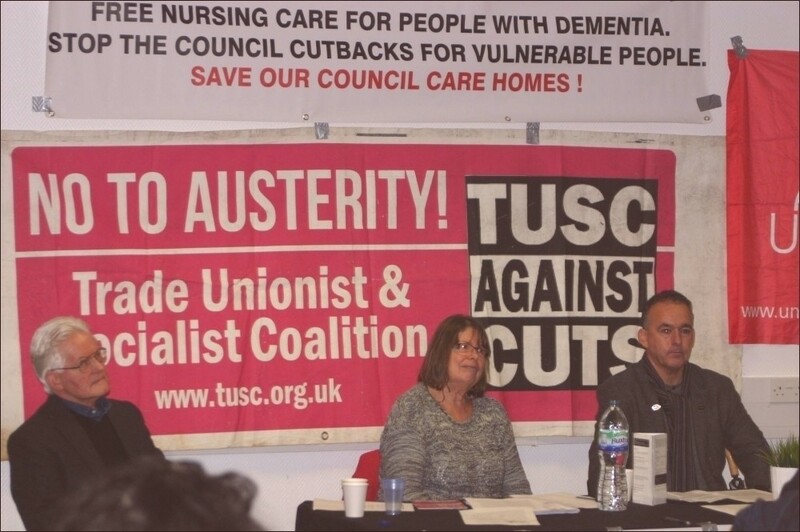 The Socialist Party believes that TUSC should continue with this activity but should also launch a new initiative this autumn. We propose a councillors' petition to the shadow chancellor John McDonnell, asking him to guarantee that an incoming Labour government would replenish any reserves a council used to avoid cuts now and underwrite borrowing made for the same purpose. Such a commitment to retrospective action is not unprecedented. When the newly-elected Labour government of 1974 moved to repeal the Housing Finance Act it included provisions to remove penalties from councillors who had refused to implement the act (although 17 MPs voted with the Tories or abstained to keep the disqualification against the eleven Clay Cross councillors in place). Notoriously the Con-Dem coalition passed the 2013 Jobseekers (Back to Work Schemes) Act to retrospectively reverse a court of appeal ruling that jobseekers were entitled to compensation for having been made to work unpaid on workfare schemes. With such precedents, why couldn't an incoming Labour government effectively indemnify councils which refuse to implement cuts now? Such a pledge would give confidence to those Labour councillors who really want to act on Jeremy Corbyn's anti-austerity message - and put pressure on those that don't. As Labour was changed into New Labour, the power of the unions within the party was gutted. A vital step to transforming Labour into a party representing the working class must be to restore a role for the unions, the biggest voluntary organisations in Britain, commensurate with their position as the collective voices of millions of workers, as part of a complete democratisation of the party. While the charter's demands may need to be modified after the Labour Party's democracy review proposals are released in September, it is regrettably not likely that the review will recommend such a transformational approach. TUSC could play an important role in popularising what will still need to be done to recreate Labour as a workers' party. TUSC has already recalibrated its electoral activity. 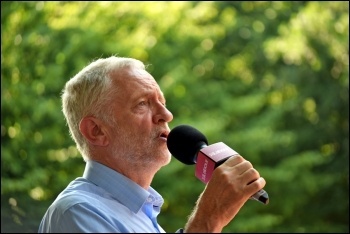 In the 2017 general election, in which the working class had an opportunity to put Jeremy Corbyn into Number Ten, TUSC agreed not to stand any candidates, from the position of being the sixth-biggest party on the ballot paper two years earlier in 2015. If the same situation arises - a general election in which there is the possibility for a Corbyn-led government to be elected - TUSC should adopt the same approach. But local elections are not the same as a general election, which is about determining who forms the government at a national level. The issue in local elections on the other hand should be about how councils can expand or at least defend local public services - and, in doing so, best use their still considerable powers to resist the drive for cuts and privatisation coming from Westminster. But that is not the position of Labour's right wing in local government - which predominates not just among MPs but in local council Labour Groups too. They unresistingly carry out the Tory government's austerity agenda. It is councillors from this camp that TUSC has stood candidates against in the three sets of local elections held under Jeremy Corbyn's Labour Party leadership. And while the responsibility for challenging such alleged 'Labour' representatives who implement Tory policies does not rest with TUSC alone, our coalition should continue to contest local elections on this basis, beginning preparations this autumn to stand in the May 2019 elections. The Socialist Party has been committed to TUSC because we recognised the role it could play in crystallising the arguments around working class political representation, particularly within the trade unions. Participating in TUSC inevitably puts constraints on the Socialist Party's independent activity. However, although the terrain has changed since Jeremy Corbyn's election as Labour leader, we are prepared to continue carrying this overhead because we believe TUSC still has a role to play, if it is recast along the lines set out here. It would be wishful thinking, however, not to recognise that there is some support within the RMT for TUSC not to continue. It is inevitable, for example, in a union of over 80,000 members, that there will be some who want to support Labour councillors in local elections regardless of the cuts policies they are carrying out, and who will be unhappy with TUSC standing candidates next May. So it is appropriate to discuss what TUSC's future role should be or whether it is time to end the project and agree a process to do so. But that is not the preferred position of the Socialist Party. 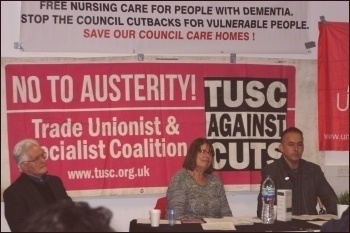 We not only defend what TUSC has achieved in its eight years of existence but believe that its potential role in helping establish socialist, working class political representation is far from exhausted.